Visit the Healthcare Industry Pipeline at www.hin.com - Download White Papers and Case Studies, Register for Webcasts! A complete selection of health management resources for healthcare executives. Your one-stop shop for the leading publications you need! Click here to browse our categories or conduct key word searches to find the products that best meets your needs! The Healthcare Intelligence Network Career Center brings together qualified healthcare management professionals seeking new career opportunities and healthcare organizations that are seeking to fill health management positions within their companies. Earn gift certificates by referring your colleagues to the Healthcare Intelligence Network! White Paper Abstract: Despite challenges ranging from physician and practice buy-in to recruitment and retention, the number of healthcare companies embedding or co-locating case managers in care sites continues to rise. 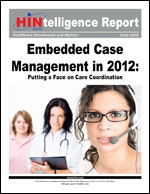 Just over half of respondents to the Healthcare Intelligence Network's third annual Healthcare Case Management e-survey, conducted in February 2012, said they embed case managers at the point of care; of those 2012 respondents, nearly 60 percent cited the primary care practice as the most likely work site for an on-site case manager. This executive summary examines the responses of companies who embed case managers, providing a high-level look at work locations, program components, and the greatest challenges and benefits of this case management strategy. Responses provided by 153 healthcare organizations revealed that case management presence at primary care sites had quadrupled in just the last 12 months, from 14 percent in 2011 to 58 percent this year. Subscribe to the Free �HIN Weekly Update� e-Newsletter and receive the latest trends, news and analysis in healthcare. We value your privacy! Your name will not be rented to anyone.